There are loads of opinions on how Ofcom plans the nation’s VHF/FM broadcast spectrum, but until now very few facts. Therefore this year we have been on a journey to investigate the facts. The result is this paper. It is written from a technical, not a regulatoiry perspective, but (hopefully) is written in a fairly simple style which is accessible to non-technical people who have an appreciation of the basics of radio. Here is the Executive summary – the full document is 19 pages long and available here. 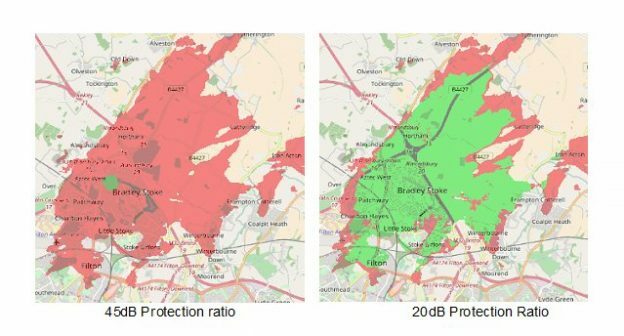 This paper examines the impact of Protection Ratios on FM Broadcast spectrum planning in the UK. These parameters determine not only the reliability of reception, but also the ultimate capacity of that spectrum to deliver radio services. There are many opinions on both sides about Protection Ratios, but mostly to date they have been opinions, not facts. This paper therefore seeks to establish some relevant facts to permit a more informed debate. 1. Consider the evidence presented in this document on face value as a technical proposal, on its technical merits, without being influenced by political considerations, current technical policy or incumbents’ positions. 3. Test the evidence – either by controlled trials, or inspection of situations where (accidentally or otherwise) the conditions for reduced protection ratios already exist in the UK. 4. Consider reducing co-channel protection ratio by 15 dB and 1st adjacent protection ratio by 22dB in a phased manner. 5. Review the evidence for divergence from ITU-R BS.412-9 for 10.6 to 10.8MHz relationships. If the evidence is not strong enough, revert to ITU-R BS.412-9 approach (-20dB PR on 10.7MHz only). 6.1. NOT to consider re-planning frequencies of existing stations – this is unrealistic for such a mature technology as FM broadcast, and total benefit would be unlikely to outweigh total cost. 6.2. NOT consider (yet) implementing on high power transmitters above (say) 500w – in order to minimise any widescale risk. Evaluate at a later date. 6.3. Consider implementing new PR’s for new services and technical change requests on low power transmitters below (say) 500w. 6.4. Implement any reduction in PR’s in more than one stage to minimise risk – maybe 6dB steps reduction over many months. The full document is 19 pages long and available here. This entry was posted in Uncategorized on December 4, 2017 by radiohead.